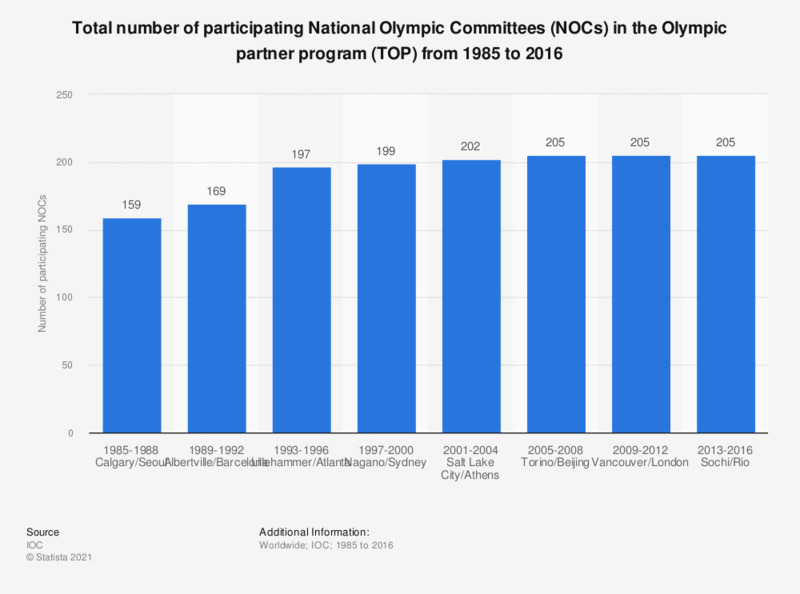 This graph depicts the total number of participating National Olympic Committees in the Olympic partner program (TOP) from 1985 to 2016. In the quadrennium from 1993 to 1996, the total number of participating National Olympic Committees in the Olympic partner program (TOP) was 197. The Olympic Partner (TOP) program is the highest level of Olympic sponsorship and provides sponsors with exclusive worldwide marketing rights to the Summer, Winter and Youth Olympic Games. For the London 2012 Olympic Games the TOP partners are Coca Cola, acer, Atos, DOW, General Electric Company, McDonalds, Omega, Panasonic, Samsung, VISA and Procter & Gamble. What do you think should be the focus of the US Olympic Committee (USOC) on winning medals? What type of media will you use to follow coverage of the 2012 Olympic Games?